Take to the open road with Back Roads Northern and Central Italy and discover 25 leisurely drives through the country's beautiful villages and stunning landscapes. Tour the Italian lakes, explore the Chianti vineyards of Tuscany or discover the historic towns and cities of the Veneto Plain. 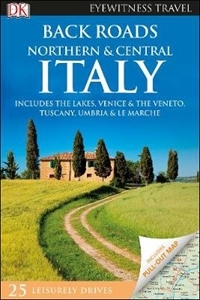 Packed with insider tips and information, this easy-to-use guide reveals incredible sights, hidden gems and authentic local experiences that can only be discovered by road.Inside Back Roads Northern and Central Italy:- A free laminated pull-out road map of Italy helps you navigate with ease- 25 easy-to-follow driving tours, each lasting one to five days- Guided walks take you through Italy's historic towns and villages- Experts suggest the best off-road activities in each area, from taking a wine tour to visiting art galleries- Contains essential travel tips, including our pick of where to stay, eat and shop, plus useful travel, visa and health information- Covers all the Italian rules of the road - Includes postcodes for use with GPS, plus information on road conditions and parking tips - Covers Turin, Piedmont, Italian Lakes, Lake Maggiore, Lake Como, Lombardy, Lake Garda, Trentino-Alto Adige, the Dolomites, Friuli-Venezia Giulia, the Veneto Plain, the Po Delta, Ravenna, Genoa, Azure Coast, Cinque Terre, Tuscany, Chianti vineyards, Umbria, Perugia, Apennine Mountains, Montefeltro Mountains, Le Marche and more.Looking for a comprehensive guide to Italy? Try our DK Eyewitness Travel Guide Italy.About DK Eyewitness Travel: DK's award-winning Back Roads guide books take the work out of planning a road trip, with easy-to-read maps, tips and tours to inform and enrich your journey. DK is the world's leading illustrated reference publisher, producing beautifully designed books for adults and children in over 120 countries.